Home » Lower Extremity Amputee Program L.E.A.P. 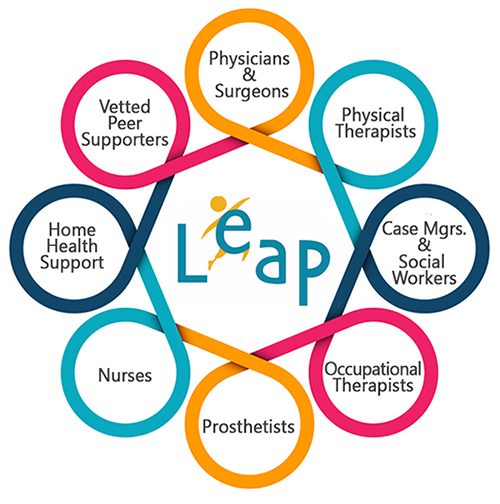 The LEAP, Lower Extremity Amputee Program, serves physicians and their patients by providing a streamlined process to help navigate patients through the treatment process. Reach Orthotic & Prosthetic Services recognizes that care for amputees can be disjointed and confusing. Reach developed the LEAP program to provide an improved way to navigate the process. We have teamed with physicians and rehab specialists to provide a program that connects patients with key treatment providers. As a partner in rehab, Reach O&P provides education to L.E.A.P. team partners on the latest treatment processes and technologies available. For information on LEAP contact Heather Carter at 757-532-6147.